Personal visioning is the process of “looking” into your future and capturing its essence in words and pictures (any media). It is a representation and imagination of your future state, part idealism and part plan. It addresses any part of your life you choose, e.g. personal, family, career, relationships, financial, etc. I have a vision of my life that guides me in positive and energizing ways. I “see” my ideal future. A documented vision is powerful because it can be shared and revisited. Reviewing it from time-to-time implants it in our mind, helping us subconsciously to be propelled toward it. This is simply another way of “becoming what we believe”. What do you like about your current life? What do you wish was currently better? Turn each of these thoughts into a short vision statement. See below for a few examples. Review the vision regularly. Think about how you can bring detailed richness to the statements. Update it as you learn. 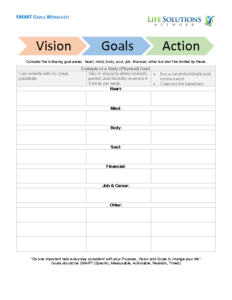 Add appropriate SMART goals to activate essential vision elements. A vision is just part of your “life plan”. Other key components might include Purpose, Goals, Values, Career Plan or long-term Budget. My home is warm and inviting to family and friends (not “I live in a big house in Hawaii”). I am content with my resources of time and money (not “I am rich” or “on the beach 24 hours a day”). I am surrounded by people who love and respect me. I experience the world’s attractions and cultures (not “I want to travel”). Learning and growth occur every day in unexpected ways. It attracts commitment and is energizing. It creates meaning in a person’s life. It establishes a standard of excellence. It bridges the present to the future. It transcends the status quo. The documentation of a vision could come in many forms, e.g. document, poster or video. It needs to emotionally capture your imagination with words, pictures (and any other senses you can capture) in your own style. Sharing it with others enables input and support. A vision is personal…your words, your ideas and your media. It must grab your heart and mind. A vision can be personal, family-oriented, team-oriented or even company-oriented. You choose the scope. This wiki addresses the personal side but most of the ideas are consistent. Where do I want to be in 5, 10 or 20 years? Relationships, career, spiritually, location, finances, retirement, etc. Why do these ideas about my future seem important to me? How will I make my vision a reality? What goals are needed now? Are there intermediate milestones? Personal Vision Statements: Propel Yourself Towards Your Dreams by Brenton Russell on BrentonRussell.com. How to Create a Personal Vision by artgym on YouTube. This video explains what a vision is, why having one is important and will tell you how you can create your own personal vision for the future in three easy steps. My Personal Vision by Casey Pearce on YouTube.